Need an easy, healthy side dish to add to almost any meal? Look no further. These Simple roasted sweet potatoes are here to save the day. Every day. They only have 4 ingredients and are so easy to make. They taste delicious, are full of nutrients, and go with everything. 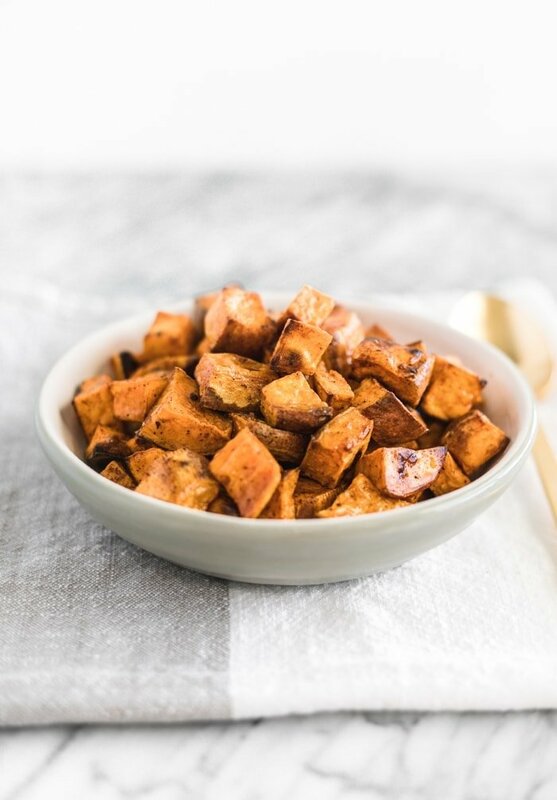 It’s easy to see why roasted sweet potatoes are one of my favorite go-to sides! How do you cook roasted sweet potatoes? Roasted sweet potatoes are so easy to make. 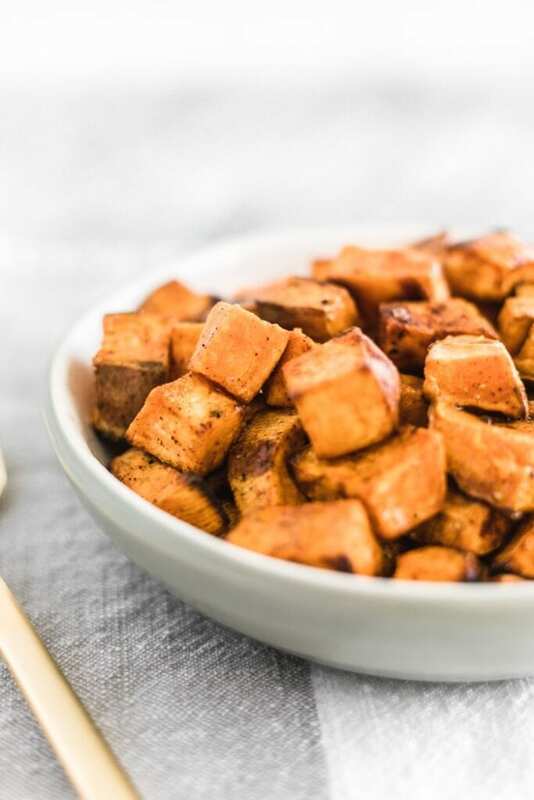 Just toss cubed sweet potatoes in a bit of oil and touch of spice, spread evenly on a baking sheet, and roast in a hot oven. Instant side dish for any meal! Just make sure the sweet potatoes aren’t too crowded on the baking sheet, or they’ll steam rather than roast, and they won’t get those crispy outsides. Let’s just talk about how healthy sweet potatoes are. Not only are they full of potassium and fiber (especially if you leave the skin on! ), but they are also low in fat and calories when prepared in a simple way like roasting, baking or boiling. Where sweet potatoes really shine, though, is in their vitamin A content. This vitamin is important for your immune function, eye sight and cell health. 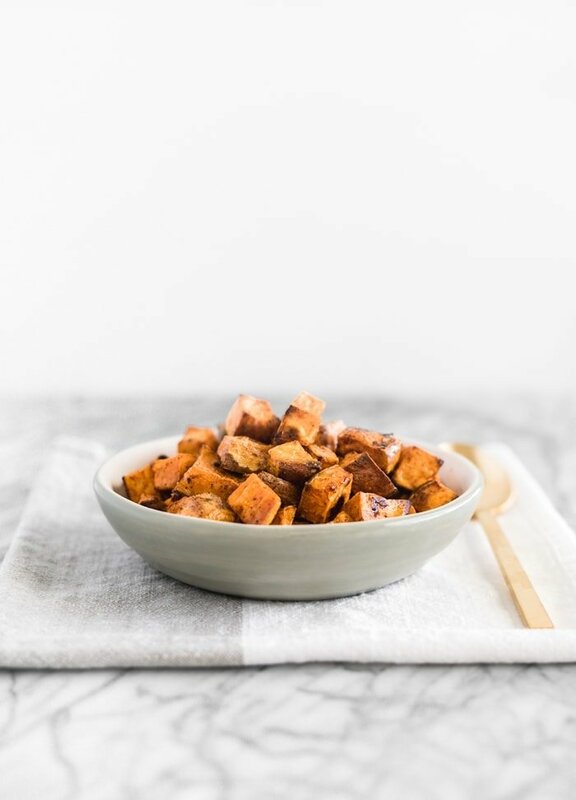 One 1/2 cup serving of roasted sweet potato cubes provides over 100% of your daily vitamin A needs! And the oil used in cooking roasted sweet potatoes helps you to absorb vitamins like vitamin A effectively. What do I eat with roasted sweet potatoes? You can use roasted sweet potatoes in so many ways! I like to cook them as a simple side to go alongside chicken or fish and a green veggie for an easy meal, but you can also use them for so much more! Use roasted sweet potatoes as a vegetarian taco filling with black beans, in a yummy buddha bowl, or in a breakfast hash. (Leftovers are especially good for breakfast!) They take almost no effort, so you really have no excuse. One more thing before you get to cooking. If you haven’t already, you can now find me on Yummly! If you aren’t sure what that is, go check out my page. Ok, back to the sweet potatoes. Go cook them! Preheat oven to 400° F. Line a baking sheet with parchment or a silicone baking mat. Wash sweet potatoes and dice into even cubes (about 1 inch). I like to leave the peel on, but you can peel your potatoes if you wish. 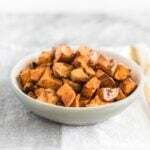 In a large bowl, toss sweet potato cubes with oil and spices until coated evenly. Spread onto lined baking sheet, spaced evenly so that they are not touching. Roast potatoes for 30-45 minutes, stirring every 10 minutes or so, until done. They should be soft inside but crispy outside. Sprinkle with additional salt and pepper if you wish. I love sweet potatoes! I actually roasted up a whole bunch Sunday and whipped up a pesto sauce yesterday using these, cashews and a little jalapeno! Sweet and spicy- woohoo! Yum! I’ll have to try that sauce! Roasted sweet potatoes are a go-to side dish in our house. So easy, so nutritious, and especially delicious! 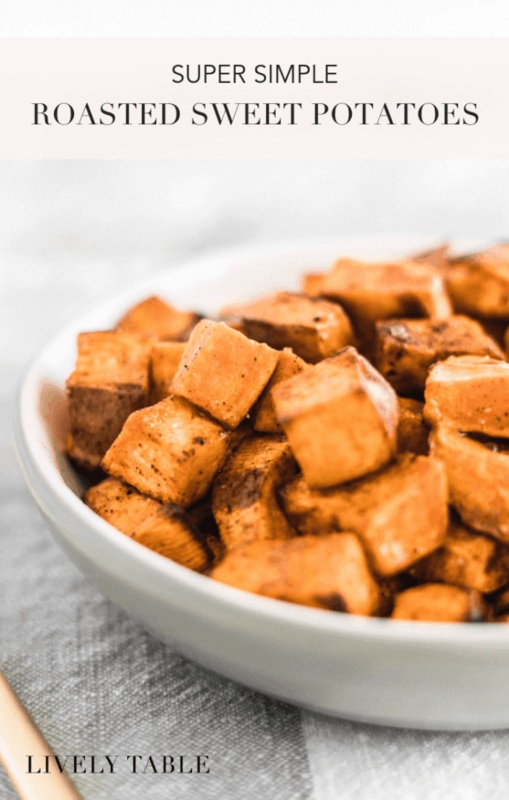 I love roasting sweet potatoes– have you ever tried smoked paprika? We made roasted zucchini last night with smoked paprika and it was so good. Love roasted sweet potatoes – we do them at least once a week. Will totally try with the cinnamon and paprika touch! Yum! We have been doing them so often, too! These wrew amazing! Paprika, who knew? !